After the empowering speech COLUS gave us yesterday, we discussed further what would happen in terms of reaching the iron in the cliff mine. Myself, THEROS, UOPETA, OROTHO and Joe needed to establish a way of linking the base up to the cliff mine, just in case whoever was spying on us had returned. We couldn't take the risk. OROTHO and Joe seemed really enthusiastic about about solving this issue, whilst the rest of us just wanted to get hold of the iron, and begin constructing the tunnel. We spent a few hours discussing the orientation of the cliff mine respective to the base, and the layout of the cliff mine thus far. We determined that there was a good chance that one of our mineshafts ran very close to the opening of the base. "If that is the case, then we could start the tunnel tomorrow, and be into the cliff mine within a few hours! We'd need to run a few final calculations... You know, just so that we don't end up flooding the base! I think that would alert anyone watching a lot more than trying to make our way to it via the hatch!" We headed off for bed; it had been a long day, and tomorrow boasted the promise of an even longer one. We would need our strength to ensure that we finished the work on time, and were able to support the others. Amie and COLUS would be working further towards the tunnel security, whilst AMPHIS and THEXIS will be starting to dig the initial tunnel based on the map layout. Thankfully, THEROS included a scaled system to his maps, and each millimetre is the equivalent of eight real-world metres. THEXIS and AMPHIS would be using that scale to ensure they got the distances right. But by then, we should have retrieved the iron and gold from the storage, smelted enough to start the bracings, and join them in the tunnel excavation! Despite being incredibly tired, both mentally and physically, I was the first to wake up, and decided it would be more time efficient to wake the others up too. Well, I was the first out of everyone aside from OROTHO and COLUS; they never seemed to sleep at all! Once everyone was awake and full on breakfast, we set straight to work on the tunnel to the cliff mine! With it being early morning, and with AMPHIS and THEXIS still in bed, we had quite a good start on the day, so we utilised it immediately. With guidance from OROTHO, me and UOPETA managed to make a start on the tunnel, whilst THEROS helped Joe construct some basic rail tracks. After we had made a decent amount of progress, OROTHO went to join them in constructing me technologically advanced power rails to boost the cart along the track. Luckily we weren't that far beneath the surface, so the stone and dirt was pretty low in density and easy to make our way through. "So we continue through this wall for a few more metres, and provided OROTHO was right, we should break into the side wall of one of mineshafts...? It's hard to relate everything being so closely connected, but maybe we were fortunate in the placement of our mineshafts!" 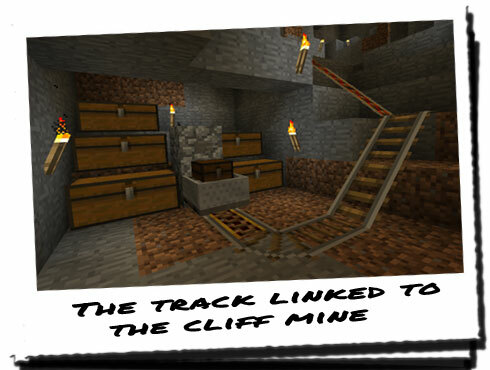 We had all known that we would need to somehow connect the cliff mine to the base with a minecart track at some point, but we assumed we would connect it via a concealed entrance minecart track. Going through close to the entrance of the base directly into the heart of the cliff mine though seemed to make a lot more sense, as less resources were being used, and it was faster and required no need to expose ourselves on the surface! I stopped mining and listened; UOPETA hit the stone wall in front of us again with the same power he had before, and instead of being met with the high-pitched chink sound, we were instead greeted by the inviting sound of a low thud! We were nearly through! 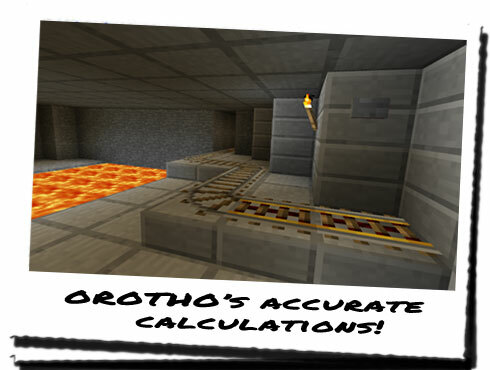 If we went along with OROTHO, we should be pushing through to the other side of one of the mineshafts. However, if we'd gone too far in either direction, we could be opening up a way that could flood the base! Eventually, after a few more minutes of hacking at the wall, UOPETA broke through, causing a thin ray of light to splinter through the hole... Widening the hole, UOPETA revealed that we had managed to break through perfectly! We were in one of the shafts! "This is... THEROS's shaft... Excellent! Obviously it was a good idea to have three separate shafts then." We went back to the base along the path we had made to inform OROTHO and Joe that we had broken through. With all of the actual mining done for the time being, we've been helping Joe, OROTHO and THEROS lay and connect the minecart tracks. Well, Joe and THEROS anyway; OROTHO was busy constructing a minecart with some iron that was left over from a previous project. He didn't go into specifics, stating only that it was "before my time"... Whatever that meant. Presumably before I properly joined the Lone 7... 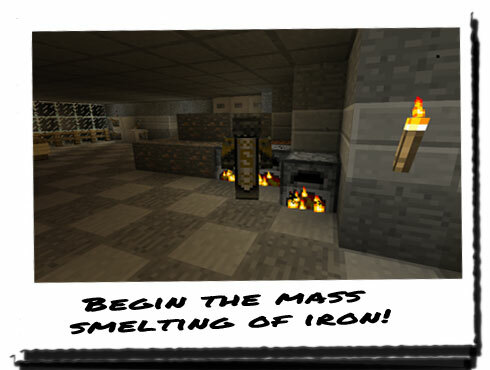 It wasn't long before we had the beginnings of the minecart track started; we had a powered booster at the beginning on the base-end to allow us to send empty carts up to the cliff mine iron storage. Now all we had to do was continue the track up to the actual storage itself. We had started to run out of iron ingots to smelt into minecart track or pins, so me and UOPETA volunteered to retrieve some by hand from the cliff mine storage. It would take slightly longer than the actual minecart system itself when fully implemented, but we were able to carry enough to help construct more track. "Bring back some of the gold ore as well; I will need it for the electronic couplings in the booster tracks." With that in mind, me and UOPETA set off towards the iron storage to retrieve as much gold and iron as we could carry. It turns out that between us, we can carry quite a lot! Obviously we were slower on the way back, but after we managed to get through the small passageway, it was a straight line to the lab! AMPHIS and THEXIS were awake now, and were helping Joe set up a series of furnaces to smelt the iron. On our return journey from our third trip to the storage area, AMPHIS had already begun to smelt the iron for use in the tunnel. Joe and OROTHO had enough smelted iron to make the tracks and booster rails without needing any more, so we began to help with the construction of the main track. Replacing the pickaxe in hand with a hammer, me and UOPETA helped to pin the minecart rails down, bit by bit. Every now and again we'd need to go back to the lab an retrieve more rails, and we'd check on everyone's progress. COLUS and Amie had settled on a tunnel design which would require the least support from iron bracing, whilst AMPHIS and THEXIS had already smelted a lot of the iron ore into pure ingots. "You might want to hurry things along you two; we've nearly finished the minecart track, so you're going to be inundated with iron ore soon!" We've finished! The minecart track is complete, and runs from the base-side entrance of the lava channel up to the actual iron storage in the cliff mine. It's taken a good two hours, and in that time AMPHIS has managed to smelt a decent amount of iron for OROTHO to use for the tunnel bracing. COLUS and Amie gave THEXIS the go-ahead to start the actual tunnel, and we've joined them now that we've finished the main tunnel to the cliff mine. As we put in the final booster rail at the start of the iron storage, we realised that we could make sure the entrance was never found. As the entrance worked on a simple OR piston gate, one or the other lever had to be pulled to open the gate. However, any lever could be used to close it again. However, at this point, the same lever had to be pulled to open it again. If someone tried to open the gate from the outside when it's locked from the inside, the door will remain closed. This was the whole point about the security door. At the moment, as we had left through the entrance, it was closed via the outside lever. If we flicked the lever on the inside, we can secure the gate. It won't open the door, but it won't allow anyone to open it from the outside either! If someone were to find the lever outside, and pull it, nothing would happen. UOPETA flicked the lever down, and dusted his hands off. "There! Like to see anyone get in now!" We could now safely access the cliff mine via the base and vice versa, without needing to go onto the surface at all! The cliff mine entrance would remain sealed, and the hatch to the base is locked out as well. The beginnings of our underground transport network had begun! We could now safely travel between the base, the cliff mine and the active portal completely undetected! Our celebrations were cut short however by the sounds of a low rumbling, that appeared to get closer. Standing in silence, with a mixed look of curiosity and readiness on everyone's faces, we waited for the sound to grow nearer. Eventually we determined the sounds was coming back from up where the mineshafts were, and turning to look in that direction, it wasn't long before we found the cause! An object of startling speed rushed forward along the minetrack and we dived out of the way. We then realised that it was a minecart! As we watched, the iron cart came hurtling down the track, worryingly fast. But as it came towards the minecart dock, it slowed down considerably, before resting perfectly against the booster rail end wall. An exclamation from slightly further along the track, and OROTHO revealed himself. He was breathless, presumably from chasing after the cart, just to check on the run from the base to the cliff mine. OROTHO came down to meet us, and was grinning from ear to ear! "A perfect run, and a perfect dock! I could't be more pleased!" "I would check it going the other way too! You do realise that with it carrying a decent amount of iron ore on the return journey, it's going to have a considerably greater deal of inertia and momentum?" "I know that, and compensated for it! The dock at the base end of the track is longer, so the braking time is increased, and there are no sudden turns from an elevated position to tip the cart over. Let's give it a test tun!" OROTHO had managed to wedge a large chest into the cart to ensure the cargo reached its destination in one piece. We fully loaded the chest and managed to close the lid again, before giving OROTHO the honour of pressing the booster button at the dock. Jabbing it forcefully with his finger, he watched with delight as the cart shot away from the storage area, before running after it, like a dog chasing a car! When OROTHO was out of sight, we all burst into laughter! The sight of seeing OROTHO so enthusiastic about something was surprisingly uplifting, and we slowly followed after him. With that complete, all we had to do was unload it, smelt it and let OROTHO and Joe craft it into bracing for the tunnel. The rest of us were on tunnel mining duty!